Rogue Entertainment is a full spectrum corporate entertainment agency specialising in corporate & business events, weddings, creative theme parties, customised award galas and event coordination. 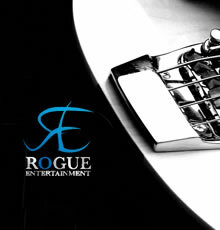 Rogue Entertainment agency provides entertainment and consultation for all types of events in any part of the country. Rogue is an industry leader in live, corporate entertainment. With an artist roster that extends to several thousand acts of all genres, featuring both regional and national acts of the highest standard, whatever you're looking for - we're almost certain to have it. Rogue Entertainment is much more than just an entertainment agency. We also have the capacity to assist artists with tailoring their promotional material to suit their target market. Our on-site, state of the art Digital Recording Studio is run by our very own recording engineer, composer and arranger. Artists are encouraged to make an appointment to update their recordings so that we are able to provide our client’s with the most recent and highest quality promotional material. As having this material on hand is something that benefits us as well as the artists, we are able to offer extremely competitive rates for our studio hours. Corporate functions that require large production including Audio Visual and backline are provided for using only the finest South East Queensland has to offer. Rogue Entertainment agency will look after all aspects of your booking to make sure that the level of involvement on your behalf is kept to a minimum. We ensure that all our artists have current insurance certificates. We will look after any and all travel arrangements including flights, ground transfers, accommodation and any other incidentals. Not sure what we can do for you? Why not contact us and ask?